United Nations Secretary-General Ban Ki-moon will today designate the world-renowned pianist Lang Lang from China as a United Nations Messenger of Peace with a special focus on global education. 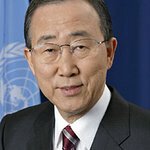 The designation ceremony will take place at United Nations Headquarters on Monday, 28 October, at a press conference to be held in the Dag Hammarskjöld Library Auditorium at noon. Lang Lang will perform Chopin’s Waltz No. 1 for the occasion. Recognized for his commitment to mobilizing support for improving the lives of children around the world, most notably as a UNICEF Goodwill Ambassador for the past 10 years, Lang Lang joins 11 other United Nations Messengers of Peace and one Goodwill Ambassador who advocate on behalf of the United Nations. Messengers of Peace are individuals who possess widely recognized talents in the fields of art, film, literature, music and sports, helping to raise worldwide awareness of the Organization’s ideals and activities. Through their public appearances, contacts with the international media and humanitarian work, they expand public understanding of how the United Nations helps to improve the lives of people everywhere. Lang Lang, who began playing the piano at age three, played at the opening ceremony of the 2008 Summer Olympics in Beijing, the 2009 Nobel Peace Prize ceremony for United States President Barack Obama and the Diamond Jubilee Concert of the Queen of the United Kingdom at Buckingham Palace in 2012. He has performed with all the great orchestras and maestros around the world. In October 2008, he launched the Lang Lang International Music Foundation, with a mission to inspire and motivate the next generation of classical music lovers and performers, and to encourage music performance at all levels as a means of social development for youth, building self-confidence and a drive for excellence. The Foundation operates with the conviction that music is a universal language and that music can open opportunities for communication, understanding and acceptance. The Foundation strives to ignite a passion for music in youth so that they can be leaders in bridging cultural gaps and helping unite local and global communities. In his work with the United Nations Children’s Fund (UNICEF), Lang Lang, a powerful advocate for the well-being of children around the world, has helped raise awareness to ensure every child’s right to quality health care and education. In addition, he has frequently used his music to raise funds for UNICEF and for humanitarian aid in emergencies, such as a special performance for a sold-out audience at Carnegie Hall in New York to benefit the UNICEF emergency response to the earthquake in Haiti. The other Messengers of Peace, along with their areas of focus, are: conductor Daniel Barenboim, peace and tolerance, since 2007; actor George Clooney, peacekeeping, since 2008; author Paulo Coelho, poverty and intercultural dialogue, since 2007; actor Michael Douglas, disarmament, since 1998; primatologist Jane Goodall, conservation and environmental issues, since 2002; violinist Midori Goto, Millennium Development Goals and youth, since 2007; Princess Haya Bint al Hussein, Millennium Development Goals and hunger, since 2007; cellist Yo-Yo Ma, youth, since 2006; actress Charlize Theron, HIV/AIDS and violence against women, since 2008; Nobel Laureate Elie Wiesel, human rights, since 1998; musician Stevie Wonder, persons with disabilities, since 2010; and actor Edward Norton, Goodwill Ambassador for Biodiversity, since 2010.